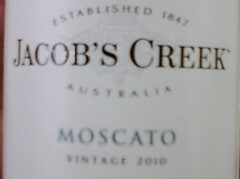 Moscato offered by Australian Winery Jacob's Creek. "A light and fresh wine with sweet tropical and pear fruit characters", says the label! "Enjoy on its own or with spicy seafood or Asian cuisine"! Was a little taken back by the screw top cap (no cork for this bottle) and the "fizzing" when we poured it into our glasses. But, we have to agree, the wine would go well with spicy seafood or Asian cuisine! Both Winos agreed to buy again.... and gave it a "Good" Rating! 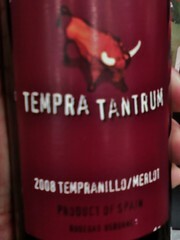 An import from Spain that combines 60% Tempranillo and 40% Merlot. 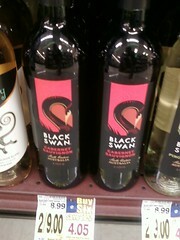 Write up from the back label made it sound really good.... Red Wine Wino tried it and found it missing something. Cannot place it other than won't buy it again. White Wine Wino tried it and liked it! Adhering to our strict rating system, Tempra Tantrum earns a "Neutral Rating"! 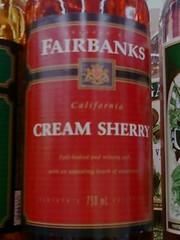 A Sherry from California.... Our true colors show when we decided to try this one. Treating it as if it were a traditional wine, we were sadly disappointed. Won't buy this one again.... Used it for mixing cocktails or cooking, could not drink like a glass of wine. Both agreed with a "Bad Rating". 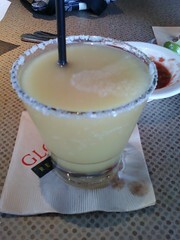 Let's Take A Break... A Margarita Break from Gloria's Restaurant! Can't just be Wine Drinkers. Have to take a break or two or three. In this case, we go with a Margarita from a local eatery - Gloria's Restaurant. Really like their House Margarita in the frozen form.... That is the Red Wine Wino prefers frozen; White Wine Wino prefers "on the rocks". Another Kosher wine that we tried on a whim. 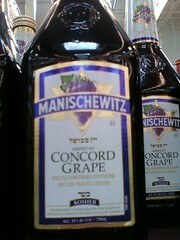 This one comes from Manischewitz. 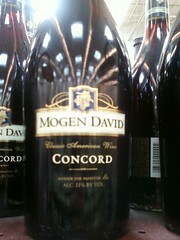 Similar rating for the same reason as the Mogen David posted previously. Rating: "Neutral". Kosher wine with 11% alcohol content. Liked it but really sweet. More a special occasion wine than a traditional wine drink. Subsequently, giving this one a "Neutral Rating" because the White Wine Wino cannot think of a special occasion to buy this one again. While the Red Wine Wino cannot think of any occasion that calls for not buying wine! 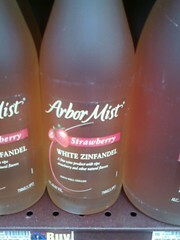 Arbor Mist has a White Zinfandel in Strawberry we tried on a whim. No cork on this one - screw top bottle instead. Not a bad "starter wine" because its sweet and "kinda like a wine cooler". Giving it a "Neutral" not for taste, just that ONE OF US would prefer other wines over this one. 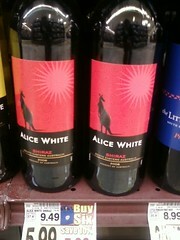 Tough one to decide between the two Winos.... Alice White Winery from Australia offers a Shiraz that we tried. However, a difference in opinion resulted. Red Wino says, "... won't buy again." White Wino says, "... will buy again." So, this Shiraz gets a "Neutral Rating". 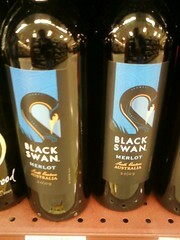 Seeing an opportunity to catch up on wine ratings, here are three from Australian Winery Black Swan! They offer a Merlot, Shiraz, and Cabernet Sauvignon. All at an economical price locally. Easy decision... "Good Ratings" for all three but more because of its price than the taste. White Wine Wino kinda wavered for a little.... At least until the third bottle! 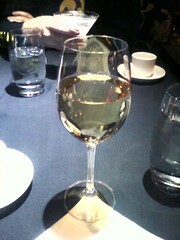 Here is white wine that we found at a Chinese Restaurant! Gave it a "Good" rating. Will buy this one again! Comes from Kenwood Winery in California. We both liked this one. Gave it a "Good" Rating. 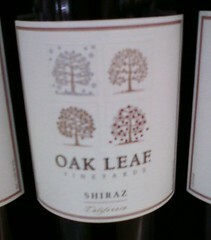 Combines a Zinfandel, Merlot, and a Cabernet! 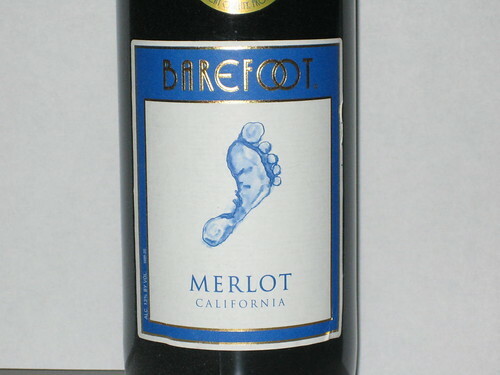 Here is another Merlot we tried while on our travels. 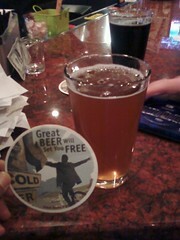 This one comes from the Great Basin Brewing Company. Not sure who makes it; sounded like "Bivio"???? Anyhow, really liked this one. Another "Good" rating from the Two Winos! Also, as we were at a micro-brewery, had to try one of their beers.... so we gave the Harvest Ale a try! Liked it as well! Harvest Ale Info: "A brewer’s celebration of our intriguing region. This rich and malty brew is accented with the delicate flavor of buttery piñon pine nuts and aromatic juniper berry and sage. 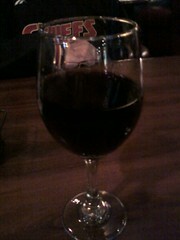 (A.B.V., 5.7%)". The two Winos are out and about this week.... Able to try some new places to eat and drink! Here is an offering that we liked from the Ruby River Steakhouse. Not certain what Winery it comes from.... but we did rate their House Red Wine (Merlot) as "Good"! 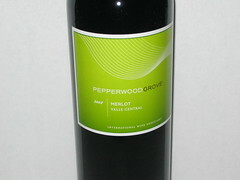 Merlot offered by Chilean Winery Pepperwood Grove. Red Wino gives it a thumbs up! White Wino concurs! So, the Merlot earns a "Good" rating. Bought it on a whim while passing through the Wine Section of the local grocery store... was not disappointed. Tried this one while on the road in Kansas. 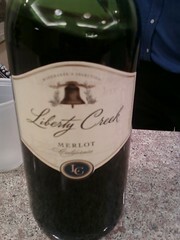 Merlot offered by Liberty Creek Winery. Really liked this one; strong alcohol content (or maybe it was because we had not eaten dinner yet). Rating this one as "Good"! 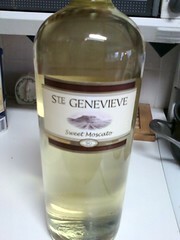 Apparently the White Wine Wino likes Moscatos, so here is an offering from Ste Genevieve Winery that we tried recently. Both Winos agreed to rate it as "Good"! 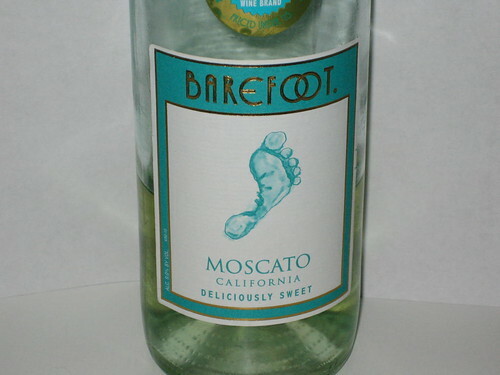 Given a choice between Ste Genevieve's Sweet Moscato and Barefoot Winery's Moscato, would go with Barefoot because of its sweeter taste! 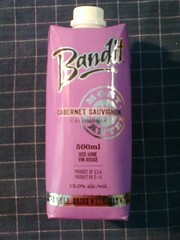 Bandit Winery from California offering "wine in box"! Bought this on a whim because it advertised "96% Wine, 4% Packaging". 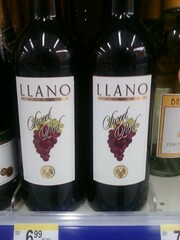 The two Wino's rated this one as "Good" as they agreed to buy more in the future! 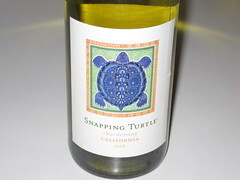 California Winery Snapping Turtle offers a Chardonnay that has the two Winos at odds. White Wino says "won't buy it again". Red Wino says "it's okay". Wine gets a "Neutral" rating. Here is another Italian Red Wine that the two Winos enjoyed! 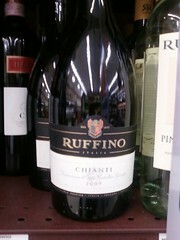 Rated "Good" discounting the Red Wino's bias toward Chiantis, the White Wino agreed to buy this one again! 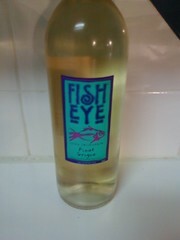 Pinot Grigio from the Fish Eye Winery of Livermore, California. 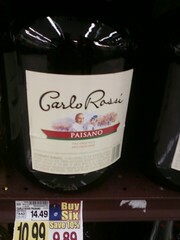 Have a slight disagreement on this one.... White Wine Wino says, "Don't buy it"! Red Wine Wino had no issues with it. Rating this one as "Neutral" since we cannot agree to buy it again or not. A Red Wine that was tough to enjoy, even by two hardened Winos. Sold in the big bottles, we bought this one way back when the funds were low. Reinforced our "rule of thumb" to not buy wines in the big bottles unless we really, really, really like the wine. Both agreed to not buy this one again.... unless the funds get really low, NOT! Rating: "Bad". 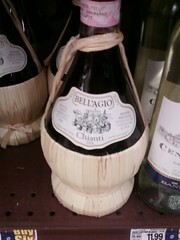 A Chianti offered by Bell' Agio that we really liked. Compliments the favorite Italian meal of our Red Wine Wino: Linguine with Mussells sauteed in a spicy red sauce with Chicken Wings and Bread on the side. Got hooked on this meal when stationed overseas in Gaeta, Italy. Chianti gets a "Good" rating. 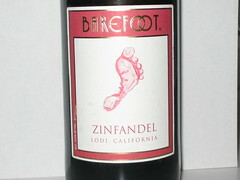 Zinfandel offered by Barefoot Winery that continues to justify our assumption - "wines from Barefoot are typically "Good" wines! Both Winos agreed to buy this one again. Slightly dry and with an alcohol content that makes for a decent "buzz". 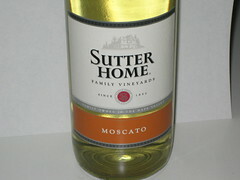 Here is another Moscato we recently tried from Sutter Home. The other Wino has a tendency toward White Wines - especially Moscato.... Regardless, we both agreed to buy this one again. Rating: "Good". 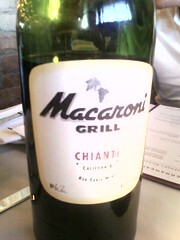 Here is one to recall from the Macaroni Grill. 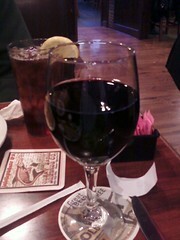 The restaurant chain offers a great House Red. 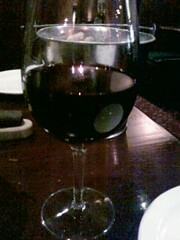 It is a Chianti that is offered by the bottle or the glass. Easily earned a "Good" rating as we order a glass or two or three with our meal! No picture but easy to remember, give this one a try next time you stop by a Macaroni Grill in your area. 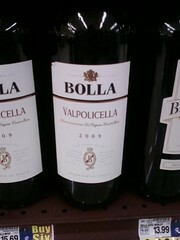 Italian Red Wine from Bolla that reminds us of a Chianti. We gave this one a "Good" rating as we consider this inexpensive import a deal (under $10) and will readily purchase this one again! 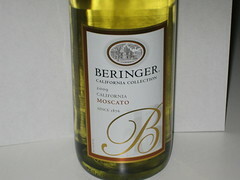 Beringer offers a nice Moscato from its California Collection 2009. Sweet but not so much that the Red Wine Wino was not turned off by it. Both Winos agreed to buy this one again. Rating: "Good"! 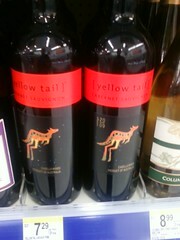 Another Red from the Yellowtail Winery from down under. Was easy to agree on this one. A definite buy for future purchases; rating "Good". 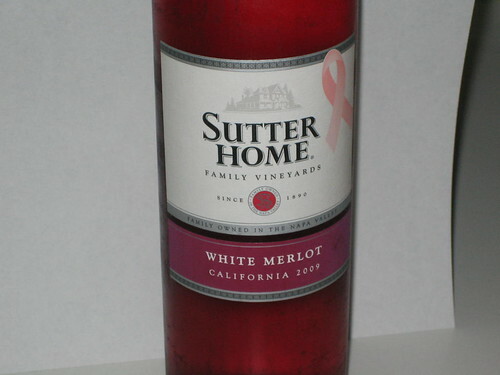 Sutter Home Family Vineyards of Napa Valley, California offers a nice White Merlot. It is a Red Wine; however, the other "Wino" on the team - who prefers White Wines, likes this one... because "it's like a White Wine". Go figure the reasoning. That said, it has a sweetness that some may like. Moreover, both of us agree that we would buy it again. Rating: "Good"! We have more reviews to post. Just taking a coffee break! For now, checkout our partner Squidoo Lens - "Black Coffee Review". We have a while to go to document the different wines we have "tasted" over the years. Eventually, we hope to catch up to our recent purchases! 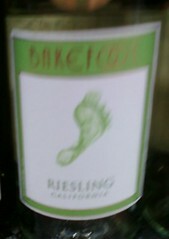 Another White Wine from Barefoot that was a toss up between the two "Winos"! This time the Red Wine lover could not decide.... Oh well, sticking to our rating system of "Good" - we would buy it again, "Neutral" - we could not agree to buy it again, and "Bad" - we would not buy it again, this Chardonnay rated "Neutral". 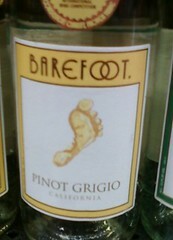 A White Wine from Barefoot that did not meet expectations. Gave it a rating of "Neutral" because we argued over buying it again. The one who prefers White Wines did not like it; the other one who prefers Red Wines was okay with it. Here is a White Wine from Barefoot that is sweet (and slightly dry) that we agreed to buy again. Gave it a "Good" rating knowing that future purchases are forthcoming. Another offering from Barefoot Winery. 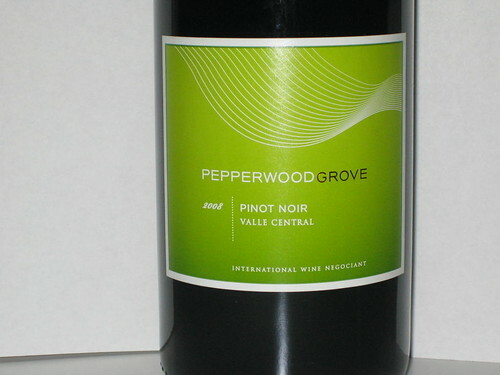 We liked this one as well and easily concluded a "Good" rating for the Pinot Noir! We have bought this one twice but would not hesitate to buy more. Just gotta get the "other person" to quit buying Shiraz! We found this one at a local grocery store selling for $3 and bought it on a whim. We hoped it was as good as the "Two Buck Chuck Wines" offered by Trader Joes when we lived in Monterey! It wasn't. However, since one of us caved in and would buy it again - because of its $3 price, we had to give it a "Neutral" rating. Did we say that we liked the wines from Yellowtail? We do! Shiraz is still our favorite Red Wine from the winery, but their Merlot comes a close second. Rating: "Good"! 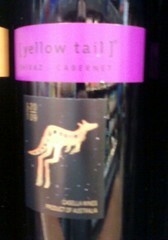 Another offering from Yellowtail! This one is a favorite. There is some bias as one of us has an affinity for Red Wines - especially Shiraz and Chiantis. In this case, we rated this one as "Good" as we buy this one regularly! 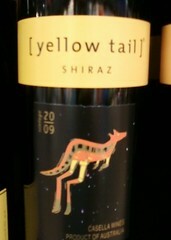 Been pleased with the Yellowtail Winery from "Down Under". Here is one that combines a Shiraz with Cabernet! We really liked this one and have been bought this one on a number of occasions. 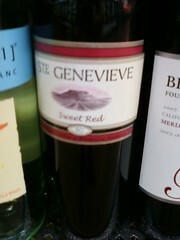 Rating: "Good"
A sweet wine as the label indicates offered by the Ste Genevieve Winery. One of us likes Sweet Reds in general, so there was some bias. Ended up rating this one as "Neutral" as we could not agree about buying this one again. Enough To Make A Cork Board....! We have enough corks to make a cork board but we have a long way to go to log the different inexpensive wines we have "tasted" over the years. Till then, stay tuned and check periodically as we document our findings! 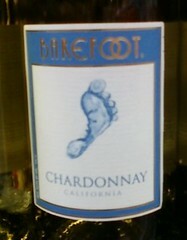 A sweet, white wine offered by Barefoot Vineyards. Has a lower alcohol content and sweet taste that make it a great starter wine to introduce new Wine Enthusiasts to the wine hobby! Rating: "Good"
Another Red from the Barefoot Vineyard. Really like this Merlot! 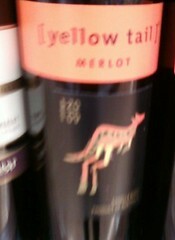 Find it to be comparable to Yellowtail's Merlot from "Down Under". Only info needed when making a decision is "which one is on sale"! Rating: "Good"
Here is a Red that comes to us from Chile! We tried it for the first time and came away pleasantly surprised! 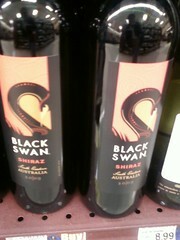 Although it was not listed on the label, we suspect its alcohol content is strong. Economically priced at around $6 on sale, we would not hesitate to purchase another bottle! 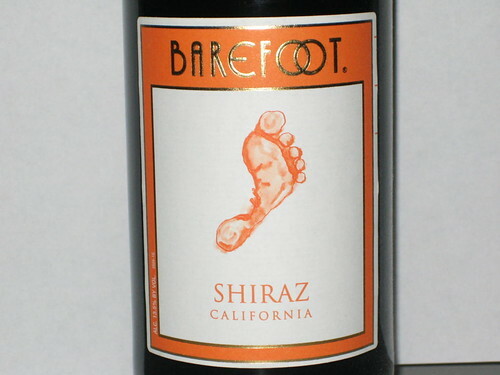 Rating: "Good"
Barefoot Shiraz is a California Red Wine that we enjoy drinking. For a less than $7 bottle of wine, it compares well with other higher priced Reds! 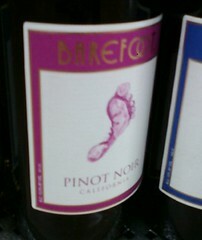 Moreover, we have not found a Barefoot wine that we did not like! Rating: "Good"... Buy this one again and again! Welcome to "The Wino's Wine Guide"! Welcome to our web log... started to log our thoughts and opinions about inexpensive wines available at local grocery and beverage stores.